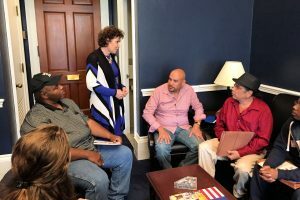 IAM members from the sugar industry in Florida visited Capitol Hill last month to lobby Congress to protect the nearly 122,000 workers throughout the U.S by keeping the current sugar policy. 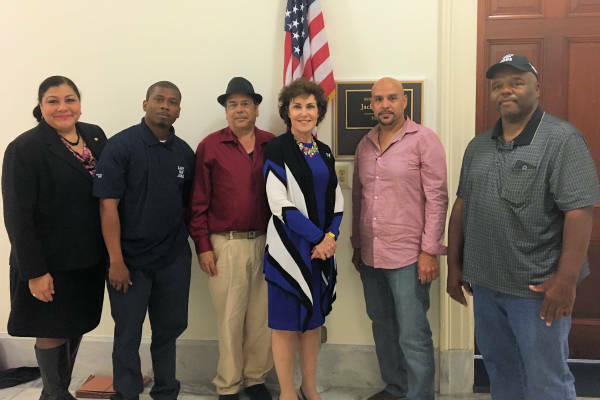 IAM members meet with Rep. Jacky Rosen (D-NV) and discuss the importance of protecting the sugar industry and the impact on working families. Local union members from Florida are concerned about the prospect of a shuttered sugar industry, which was built on the backs of middle-class families. The majority of sugar workers in the U.S. belong to a union. “We have generations of members who have worked these mills to provide sugar for the country, and to put food on their families’ tables,” said IAM Southern Territory General Vice President Mark Blondin. “Workers have seen jobs disappear because of overseas sugar for years. Members will continue to lobby their elected officials on Capitol Hill and in their Florida districts.